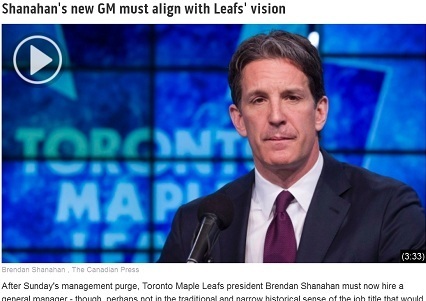 Much more dangerous than one guy having near-total control over who stays and who leaves a team…is a whole freaking quorum with their collective hand up the back of a puppet GM. You’re going to get conflicting ideals, building strategies that go 12 different directions, and in the end, a team that continues to either miss the playoffs or barely qualifies before their embarrassing first-round exit. Picking a plan and going with it will get you better results than trying to simultaneously execute every idea that your panel of people wants to try. Maybe you’ll end up finishing a few points higher in this year or that year, sure. But you’ll never win The Cup that way. Letting a guy take a ride on his ideas — even the seemingly risky ones — gives you a better chance of winning it all than doing what a bunch of people vote on. So, Toronto fans, I hope you’re well stocked up on 1967 Cup Finals footage and Mats Sundin highlight reels. They are the best things you’ll be seeing for years. Perhaps a lot of years.